Home / Employment and Social Affairs / Eastern Europe at the center of the new arm race? 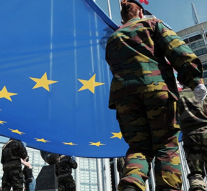 The European Union hopes that there is still a way to preserve the Intermediate-Range Nuclear Forces Treaty (INF Treaty) and to fully implement it. This position of the EU, still valid for the six months period in which Washington and Moscow could delate their “historical” decision to suspend this bilateral treaty reached in 1987, highlights that Inf provisions are crucial also for security and stability within Europe. “EU has benefited from Inf Treaty, even if we are not part in it. We continue to hope that there is a way to maintain it and to fully implement it, and the two things should go hand-in-hand, for sure”, said EU High Representative Federica Mogherini, soon after US announcement on the decision. The treaty signed by the United States and the Soviet Union in the Eighties bans the development, deployment and testing of land-based nuclear weapons with a range of 500 to 5,500 kilometres. Moscow and Washington have for years traded claims of the other party being in violation. The United States has repeatedly accused Russia of Inf Treaty violations: in particular, US officials have denounced Russia’s 9M729 missile, which, according to Washington, violates the provisions of the nuclear agreement. On the other hand, Russian politicians accused the United States of undermining global security by ending compliance with a nuclear arms treaty; while soon after US president Donald Trump also Russian president Vladimir Putin clarified that even Moscow will suspend the treaty. Now NATO has fully backed US position, claiming there is still a chance to recover the situation if Russia will comply with the provisions of the treaty in the next six months. And also, the UE is following a pro Washington stance. But a change of mind from Trump and Putin is highly unlikely, even because both leaders agree that Inf is a bilateral treaty for many aspects “outdated” and that does not include other crucial actors in nowadays multipolar world security order, first and foremost China. That’s why Europe risk to be the main looser of the suspension of this treaty, facing the risk of another cold war within its border. Europe would like to avoid a repeat of the crisis in 1983, when NATO allies decided to deploy US cruise and Pershing 2 ballistic missiles as negotiations with Moscow faltered over Russia’s stationing of SS-20 missiles in Eastern Europe. The new tensions could arise foremost in Eastern Europe, the main area where in the latest years Washington tried to counteract Moscow. Russia has deployed missile in Kaliningrad, while threatening Baltic States and in the framework of the Ukrainian crisis with the occupation of Crimea. All this has provoked a strong reaction from Nato, driven mainly by the US. In 2016 Aegis Ashore ballistic missile defence site in Deveselu, in Romania, achieved initial operational capability. Romania has become the latest piece in this security puzzle as its role is to complete the defence line stretched alongside Nato’s eastern borders around the Black Sea. Members most concerned about Russia (Poland, the Baltic States, Romania) would like the Alliance to provide a credible defence of the Eastern Flank. “Deveselu’s anti-missile shield is a rigorously defensive military structure”, Romania’s Foreign Minister Teodor Melescanu said after that in these days the Russian Defense Ministry proposed to the United States to destroy the Mk-41 missile launchers deployed in Romanian territory, pointing out that it would violate Inf Treaty. “There is absolutely no discussion about the possibility that this base will create problems for the Russian Federation. It is strictly for defense in the event of a missile attack”, stressed Melescanu. Another key country is indeed Poland. On March 2018 Poland signed the largest arms procurement deal in its history, agreeing with the United States to buy Raytheon Co’s (RTN.N) Patriot missile defense system for 4.75 billion dollars. Russia consider all this a “direct threat” close to its border and Moscow top politicians now have said that the country must build a new land-based cruise missile and a new land-based hypersonic missile by 2021 in response to the U.S. withdrawal from a major arms-control treaty with the country. All this highlight that the a new “arm race” is more than just a threat but a concrete reality already existing in Europe. That’s why also EU should adapt to new realities, considering that a new Treaty to limit this dangerous arm race should include also other countries such as China. There is an high need for “comprehensive agreement” that could regulate the global arm race for the years to come. The INF exit and Russian and Chinese challenges could also be important factors in moving toward creating a joint army in the EU. This long-waited development it is not aimed at participating to a not needed “cold war” style arm race but to enhance security while strengthening the possibilities for a strong industrial cooperation within Europe. A Common Past to Build a Common Future?